Today’s unique Japanese spaghetti sauce is mentaiko or tarako!!! 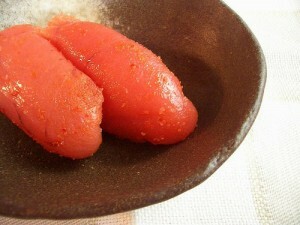 They are seasoned fish (pollock) roe, commonly eaten with rice. 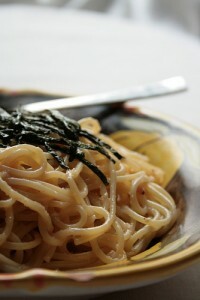 Mentaiko or tarako spaghetti are very popular in Japan; you can find them on menus at many restaurants. Making mentaiko 0r tarako spaghetti is very easy! If you can find those fish roe in your neighbor, try it! 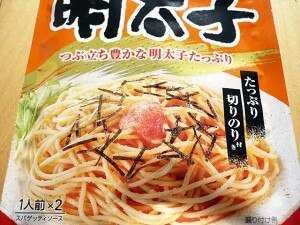 You need mentaiko 0r tarako, butter, soy sauce, nori seaweed for topping and spaghetti. Just peel the sack of the fish roe, then add to cooked spaghetti with butter and little bit of soy sauce (don’t add too much because the fish roe itself is salty). Put lots of butter and you can add calamari if you like. P.S. 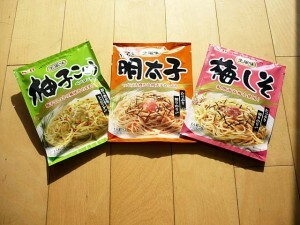 Please check “Japanese Healthy Spaghetti Sauce Part 1 — “ume-shiso” flavored” too! Let’s Origami with Chopsticks Envelop!